Weee! Yesterday was lovely, wasn't it? 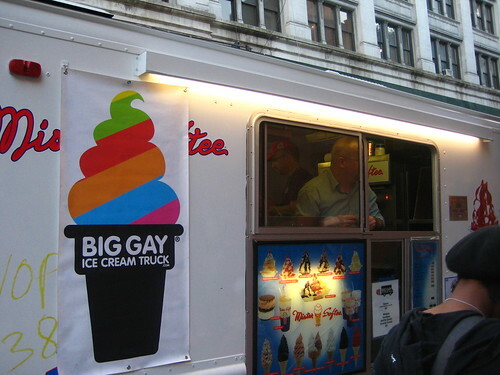 Beautiful sun, spring love in the air, Big Gay Ice Cream getting back on the road!!! Brownie and I stopped by before they left Union Square for the evening Midtown rush. 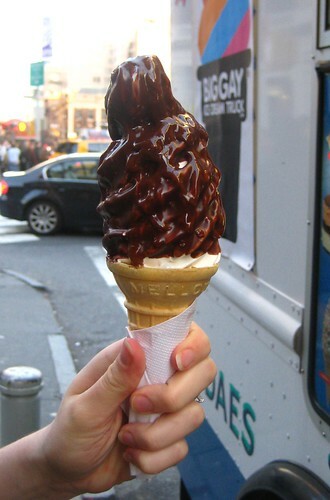 After a winter lacking unique soft serve fun, Brownie opted for her favorite summer creation, the Salty Pimp. Dulce de Leche, sea salt, chocolate dip, the salty brings out the sweet, the dulce de leche complements the chocolate. Delicious. I went with a Monday Sundae: waffle cone coated in Nutella, topped with sea salt, Dulce de Leche and whipped cream. It was a needed indulgence, and you can't ever go wrong with Nutella. I loved it so much, it might be my new favorite. The truck won't be on a regular schedule for a while, so be sure to check their Twitter. dulce de leche is the best! I got so addicted to it in Argentina, and now I wanna cone! 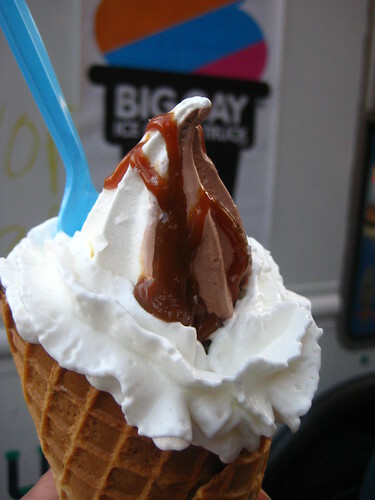 Completely rainy here in the UK so enjoy your sunshine and icecream for us! I have to try this in 2010 as missed last year! going on twitter as we speak to bookmark them! !